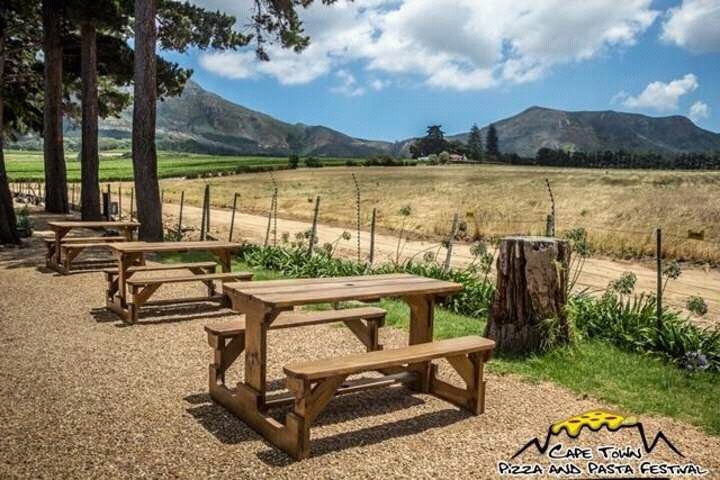 We have carefully selected only the best Pizza & Pasta establishments in Cape Town and include restaurants, independents as well as Cape Town’s best pizza & pasta food trucks. The main idea is to showcase only the cities best craft and artisan offerings. 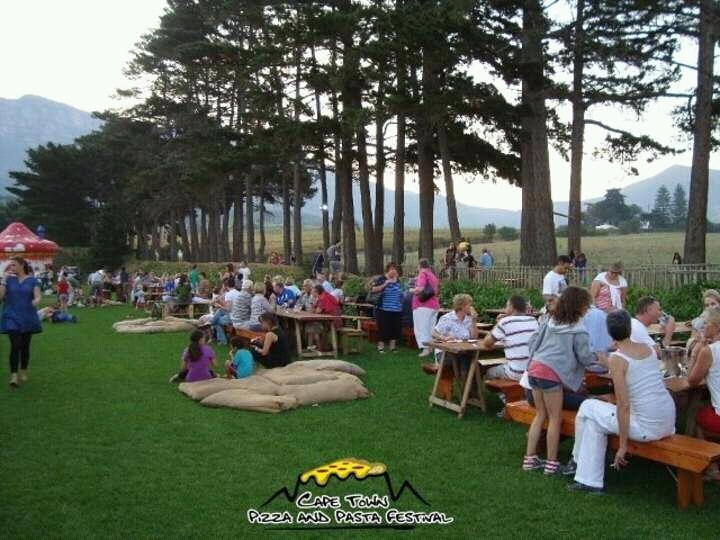 The Festival will have a unique Italian cuisine feel to it which will go unmatched for years to come. There will be craft beer, wine & dessert tastings as well as numerous different beverages stands so that we cater for all needs, young & old. We are currently busy securing our music line up and have the following bands on our radar pending their availability, some bands in question, Majozi, Daniel Baron, Shaun Koch Trio, Soldier, Sunset Sweatshop and Minx to name a few. 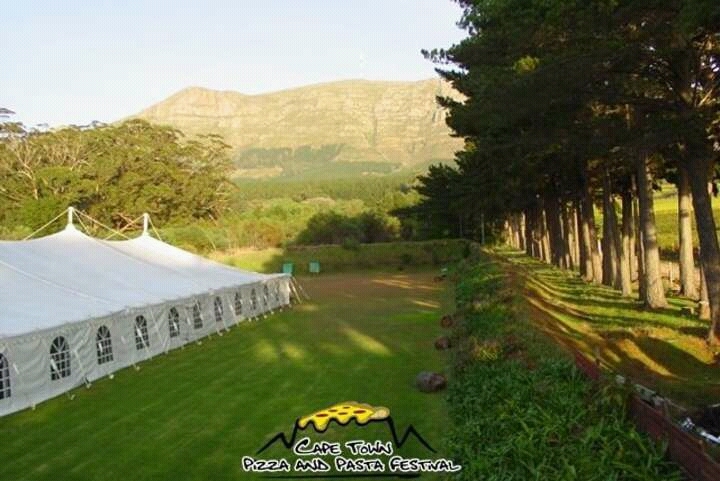 The music will be suited perfectly to compliment the festival and ambience. There will also be comedians/MCs throughout the day. Tickets: R 150 early bird SOLD OUT, R 180 normal bird, R 220 late bird if still available and are sold through Webtickets and at any Pick n Pay. Tickets will include limited vouchers that can be redeemed for pizza & pasta tasters. Festival times: Lunch sitting – 11am – 5pm; Dinner sitting – 6pm – midnight. This is an all age’s event – kids U13 get in free. Free, safe parking available on site. Please feel free to check out the Facebook page and Facebook event which is gaining huge traction. This entry was posted in Uncategorized on July 25, 2017 by shaunjengel. About 177,000 tonnes of polyolefin plastics, such as milk and detergent bottles, bread bags and assorted food containers, were recycled last year – contributing approximately R1.7 billion to the country’s GDP and creating over 14,000 jobs. However, 363,000 tonnes were not, meaning that South Africa is missing out on potential GDP growth and much-needed employment opportunities. These figures were revealed at Polyco’s recent fifth Annual General Meeting (AGM) by Chairman, Jeremy Mackintosh. Polyco was established in 2011 by polyolefin packaging producers, to reduce the amount of polyolefin waste going to landfill by providing funding to increase the sustainable collection, recycling, recovery and beneficiation of polyolefin plastics. At the AGM, it was announced that the non-profit company (NPC) – which is focused on making waste a valuable resource that works for the economy – would be rebranding to Polyco+, creating a movement designed to change mindsets and behaviours around recycling. The platform also aligns with the NPC’s role in implementing the polyolefin Industry Waste Management Plan (IWMP) that will provide polyolefin waste solutions to both metro and rural areas whilst bolstering enterprise development, job creation and transformation opportunities within the sector. Polyco+ aims to create a society where litter is minimised and the value of waste is maximised through recycling. The strategy for achieving this is underpinned by three key pillars – Celebration, Collaboration and Activation. 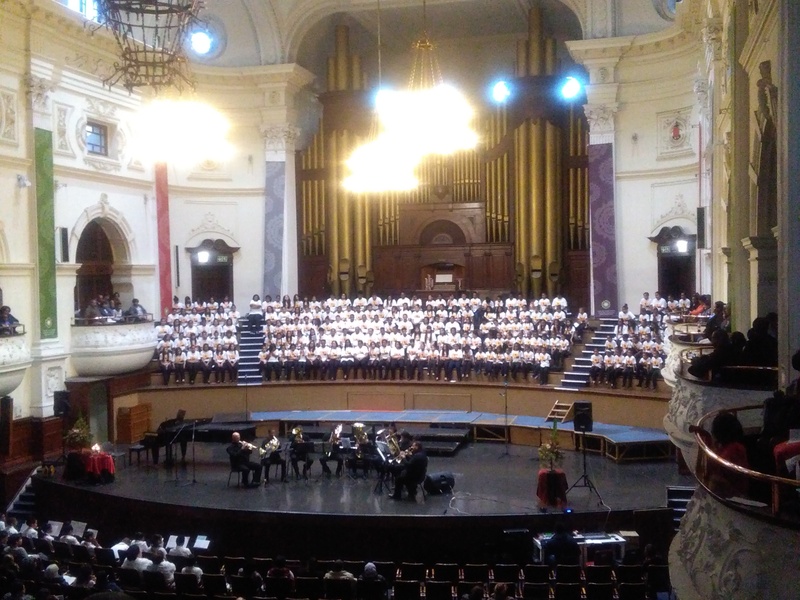 Too often we look to the world when we have talent right infront of us, today I attended the Western Cape Junior/Youth Choir Music Festival presented by the Moravian Choir Union of South Africa (MOCUSA) at the City Hall in Cape Town. Occasions like these make me truly proud to be a Moravian with it abundance of talent. 17 different youth choirs from as far as Elim, Genadendal, Goedverwacht and Pella came together as a Mass Choir and blessed us with their mesmerizing voices, yes they sang like angels and looked so bright and beautiful – clearly enjoying every minute. The afternoon included various song performances by the Mass Choir led by enthusiastic conductors as well as some Violin, Organ solo performances and a Recorder and Brass ensemble. Now that I look back we were really spoilt for choice but hey we Moravians love our music and I could see this by how well organised the afternoon was. Another indication of our love for music was when the Recorder Ensemble played one of the hymns O, had ek duisend tonge, I saw some people humming to the tune wanting to sing along, wys jou net ons Moraviers ken ons gesange. The African Traditional songs were beautifully rendered including the actions, again I some audience members wanting to join in the fun on stage. This was a definite highlight for me. These kids are really our Future Leaders, World Icons….even though the seasons change we need to keep the FAITH alive and let…. This entry was posted in Uncategorized on July 22, 2017 by shaunjengel. ULTRA SOUTH AFRICA, Africa’s largest electronic music festival, proudly announces its return to Cape Town and Johannesburg for its FIFTH consecutive year. ULTRA SOUTH AFRICA , Africa’s largest electronic music festival, proudly announces its return to Cape Town and Johannesburg for its FIFTH consecutive year. Boasting state-of-the-art stage setups, the world’s best DJs and an unforgettable festival experience, ULTRA South Africa has become a firm favourite of the South African music landscape over the last four years. Now, ULTRA South Africa announces their festival info for 2018, with its most competitively priced EARLY BIRD tickets ever! The registration process must be followed in order to get your hands on these early bird prices, for a limited time only, so don’t wait. Globally, Ultra Music Festival is gearing up to celebrate its 20th anniversary at the flagship event in Miami in 2018, making next year a momentous one for the brand, with South Africa celebrating the 5th year of the local event in the same year. Meaning that the organisers will be making the 2018 festivals bigger than ever before. The Cape Town event will be held earlier in the year, on Friday 9th February 2018, and will once again be held at the Cape Town Stadium, that iconic venue that all visitors to the Mother City know and love. The stadium is not only convenient for anyone in the city to get to and for easy access in and out, but brings a unique flavour to the event that anyone that was at the 2017 show can attest to. Not to mention the host of after-parties held around the city that are only a few minutes away from the stadium, making it that much easier to keep the ULTRA SA party going until morning! Nasrec is THE home to ULTRA SA in Joburg, and has been since Day 1, once again in 2018 this unparalleled festival venue will play host to the largest music show the people of Gauteng know and adore! This event proves each year just how a dance music festival should look, and will be no different when Ultranauts converge on Nasrec’s gates on Saturday 10th February 2018 for yet-another mind-blowing electronic music experience. Registration for early bird tickets to the 2018 shows will be done via Ultra Passport on http://www.ultrasouthafrica.com , so please complete this process as soon as possible or you will miss out on early bird prices. Ultra Passport is the global Ultra programme recently launched to reward loyal Ultranauts that attend events around the world. It allows passport holders to earn points that place them in various tiers, and within which they earn various rewards. Benefits include access to early bird tickets, separate festival entrances, access to lounge areas, and more depending on the passport tier. Points are earned for enrolling in the programme and attending events, and points valid for 25 calendar months, so it makes sense for SA Ultranauts to register now and start earning! This entry was posted in Uncategorized on July 20, 2017 by shaunjengel. Virtuoso guitarist, producer and director Jonathan Rubain is back for the third time with his sold-out hit show, I’m in love with a Guitarist, at the Baxter Concert Hall for three performances only from 3 to 5 August at 20h15 nightly. Rubain who is a gospel artist with a rich history in jazz will perform some of his latest compositions and he will showcase the exciting new talent, Bonteheuwel based the Jazz Yard Academy. As a young musician, he grew up in Hanover Park, training with and learning from well-known greats such as Mac Mckenzie and Hilton Schilder. He was also the bass player for artists such as Errol Dyers and Robbie Jansen and features on Grammy award-winner Kirk Whalum’s latest DVD Gospel According to Jazz Chapter 4. 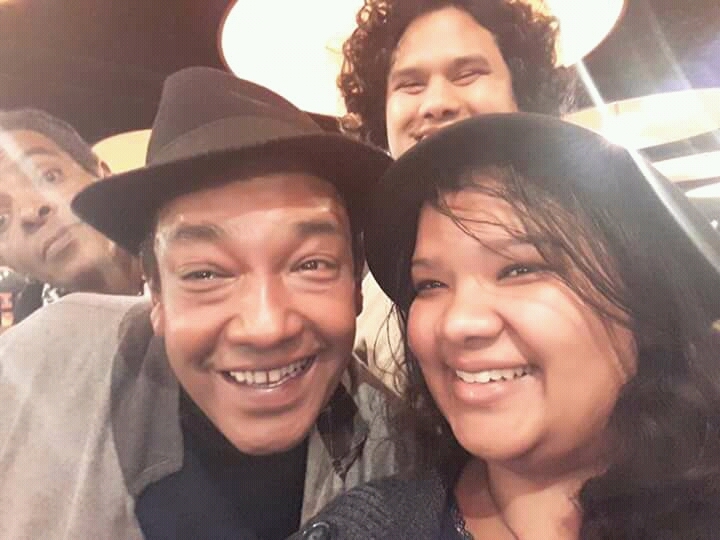 Widely regarded as part of the prestigious club of successful Cape Town jazz artists, Rubain’s hit songReason to Smile was a big success on local radio. Jonathan has had major success with his previous productions such as Intimate Nightsand How did I get Here? and I’m in love with a Guitarist is no different. He will take audiences on a musical journey inviting them to listen to sounds such as Cape Jazz, Afro-Jazz and beautiful soulful melodies on the line-up. Jonathan’s love for music is firmly rooted in childhood memories of his father playing guitar as a music lover himself. He started playing the drums at the age of six, the guitar at the age of 10 and the bass guitar at the age of 14, all in the nurturing environment of his local church. With this production he will share the stage with young talent between the ages of 12 and 16 from The Jazz Yard Academy to be part of the show. The Jazz Yard Academy is a non-profit organisation that offers free lessons to children from the area and surrounds. I’m in love with a Guitarist is on at the Baxter Concert Hall from 3 to 5 August at 20:15 nightly. Tickets cost R140 and bookings can be made through Computicket on 0861 915 8000, online at www.computicket.comor at any Shoprite or Checkers outlet. For corporate, block or school bookings, charities and fundraisers, contact Sharon Ward on 021 680 3962 orSharon.ward@uct.ac.za or Carmen Kearns on 021 680 3993, or emailCarmen.kearns@uct.ac.za. When I think of Soli Philander my mind immediately goes to the switching on of the Kaapse Liggies where he was the MC on various occasions or that TaxiVision show on Cape Town TV. He is however a man of many talents and last night I got to witness another one of those talents in the form of his new one-man show called NICE COAT….ya dit was ‘n LEKKER JAS show. The show moves like a Taxi driver through peak hour traffic down lower mainroad in Salt River, climbing the curb then swerving back into traffic all in the space of 70 minute. It is like a survival guide to Cape Town with tips on must see places and all the different cultures that comes with living in The Mother City. Soli does not mince his words as he rhymes with a reason, spitting words that I sometimes felt like I needed to consult a dictionary but hey Google Translate might also come in handy. A well-constructed narrative much more than a RACE around our city but rather a Cape Town Marathon taking you from the heights of the picturesque Table Mountain to the point where the two oceans meet, not fogetting everything in-between that makes us love this City we call Home. Oh yes, bring your passport too because you’ll go overseas ….to Robben Island that is (had to mention because it was Madiba Day yesterday after all). I thoroughly enjoyed the show, ek het gelag dat die traane loep but their were also some serious moments, thought provoking commentary added in the mix showcasing our diversity and why we love being Capetonians. Once again Soli sticks his hands in his Nice Coat with pockets full of inspiration and brings us an awesome show….all I can say is stiek uit Mase Kin you will not be disappointed. Don’t miss this fantastic talent presented by Allistair Izobel Productions – book now! This entry was posted in Uncategorized on July 18, 2017 by shaunjengel. Daai is mos ‘n Lekker Jas! 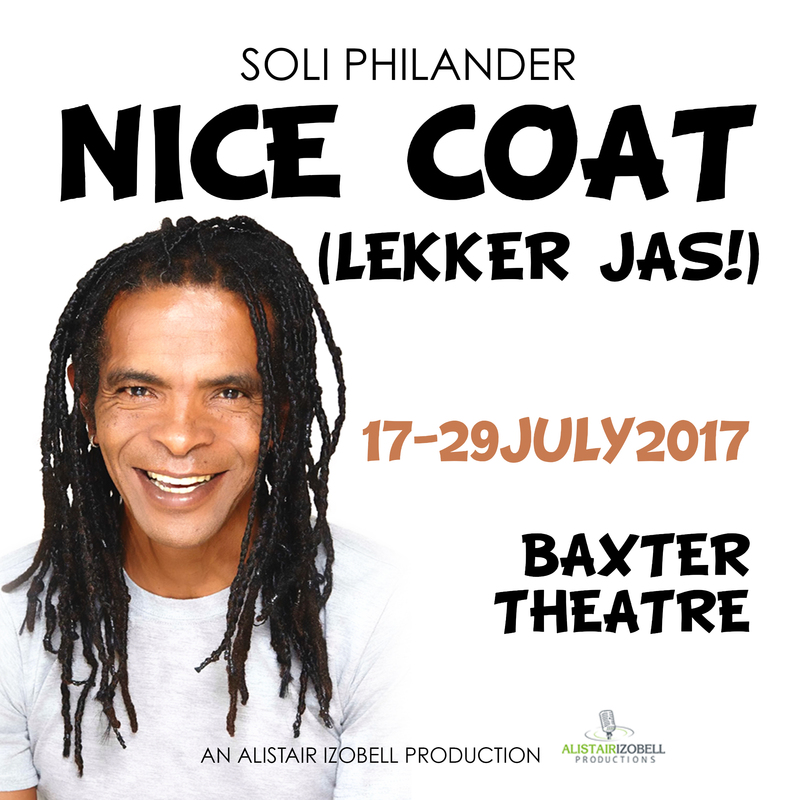 Soli Philander’s ‘Nice Coat’ is about – as he puts it – HIS Cape Town. Born out of a desire for a narrative about Cape Town – the place of his birth, his youth, his heart – that didn’t serve a political agenda, wasn’t an exercise in attracting tourists, and did not disregard the daily, stark realities so many Capetonians in surviving must embrace. Fuelled by the desire not to defend or deflect accusations levelled at The Mother City – her detractors on the inside and out – or wallow in the praise and pride from those enamoured by her, but rather to provide another view, another ‘take’, another conversation about the place he calls home, and his experience of it. Philander is adamant about the unique ‘sound’ of Cape Town – ‘there is a rhythm to it, a beat’ – that he maintains is the essence of ‘being Capetonian’. In his observations about, his criticism of, his tribute to the place he calls home, he seamlessly plays with word and intonation, idiom and phrase, rhyme and reason, to engage mind, memory and emotion in a delicately-humoured, hour-long rhyme. Philander journeys through Cape Town, HIS Cape Town, with a backpack full of memories, realizations, observations, experiences and the ever-present readiness for laughter in the face of the bleak. A trip around The Mother City – if you’ve ever been, are, or will ever be – you should not miss. This actor, director, comedian, radio presenter and writer has been part of South Africa’s media world for years, going from television, to writing, to radio to share his voice with the country. Soli Philander has become a household name and is best known for his work as a presenter for Cape Talk and for hosting popular television shows such as “Are You Smarter Than A 5th Grader”? “Let’s Fix It” and known for hosting the Afrikaans musical game show “Liriekeraai”. He has played minor roles in the 1992 feature film “The Road to Mecca” and in 2001 made-for-TV movie “Diamond Hunters”. His self-penned work for the stage includes ‘Take Two’, ‘Woeskroes’, ‘Hotnotsgot’ and ‘The Passion Gap’ (with Christian Bennett). He is also a master-of-ceremonies, motivational speaker and celebrity speaker. Soli was presenter and creative director for the popular ‘TaxiVision’ on Cape Town Television and the driving force behind the online radio-station ‘Taxi Radio’ for the five years of it’s lifespan as a hub for local broadcasting talent. Don’t miss this fantastic talent – book now! This entry was posted in Uncategorized on July 13, 2017 by shaunjengel.